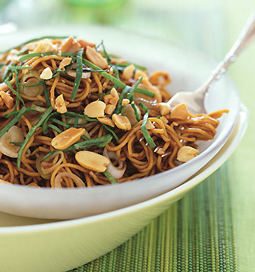 Spicy Sesame Noodles with Chopped Peanuts and Thai Basil - A recipe from Savor California, the online showcase for extraordinary gourmet foods and beverages from California. Heat peanut oil in small skillet over medium heat. Add ginger and garlic; sauté 1 minute. Transfer to large bowl. Add next 6 ingredients; whisk to blend. Place noodles in sieve over sink. Separate noodles with fingers and shake to remove excess starch. Cook in large pot of boiling salted water until just tender, stirring occasionally. Drain and rinse under cold water until cool. Drain thoroughly and transfer to bowl with sauce. Add sliced green onions and toss to coat noodles. Stir in peanuts and Thai basil; toss again. Season to taste with salt and pepper. Serve at room temperature.